The Raspberry Pi (short: RPi or RasPi) is an ultra-low-cost ($20-$35) credit-card sized Linux computer which was conceived with the primary goal of teaching computer programming to children. It was developed by the Raspberry Pi Foundation, which is a UK registered charity (Registration Number 1129409). The foundation exists to promote the study of computer science and related topics, especially at school level, and to put the fun back into learning computing. The device is expected to have many other applications both in the developed and the developing world (Read more). Raspberry Pi is manufactured and sold in partnership with the worldwide industrial distributors Premier Farnell/Element 14 and RS Components, and the Chinese distributor Egoman Technology Corp.
You can get the latest news from the Foundation Home Page, the Twitter Feed or in the forums. For Raspberry Pi frequently asked questions see the FAQ section or the Raspberry Pi Foundation's FAQ page. Products are RoHS, CE, FCC, CTick, CSA and WEEE compliant. In common with all Electronic and Electrical products the Raspberry Pi should not be disposed of in household waste. Please contact the distributor from whom you purchased your Raspberry Pi device for details regarding WEEE in your country. Price: 20USD Model A+, 35USD for Model B+, excluding taxes, postage and packaging. For information about availability and shipping see the Buying Guide. If you are interested in why the Raspberry Pi was created, and why it is what it is, check the General History page, which highlights relevant events in its history. It is not intended to be a detailed history, so it can be read quickly. You could also check the design changes page for how the Raspberry Pi has evolved, and the manufacturing differences page that may help if you are having problems with your board. Where can I get one and for how much? Base price is $20 for the model A+ and $35 for the Raspberry Pi 2. This price excludes local taxes and shipping. Detailed information and other resellers can be found on the Buying Guide page. Ensure you have all the equipment you need to go with your Raspberry Pi. Become familiar with the board layout and connect it ready for power up. If you are not using a HDMI monitor you may need to set up the correct video mode by editing the RPiconfig text file on the SD-card. Note: On the Debian OS after you log in you need to type startx at the prompt to get a graphic desktop. Having problems? Try the Troubleshooting page. You've just got your new Raspberry Pi device - what now? Learn about the basics with the H2G2 - Introducing the Raspberry Pi entry. Take a look through the Community section, which contains a range of beginner and advanced tutorials and guides, as well as groups to help you find like-minded developers. The Model B is more advanced than the Model A - see RPi Hardware. The RPi can be plugged into a suitable TV or monitor. The unit will support a range of devices, peripherals and accessories. The GPIO Headers allow the use of optional Expansion Boards or custom electronics in a wide range of projects. For more advanced issues including see Advanced Setup. The Raspberry Pi will run a range of OS Distributions and run a variety of software. See Software for an overview, and OS Distributions for supported operating system and pre-configured 'images'. Officially supported OS distributions include Raspbian, Arch Linux and RISC OS Open. Many unofficial distributions are available on the Distributions page. Advice is also available if you want to compile a kernel, boot from the network using U-Boot, or test the Pi's performance. 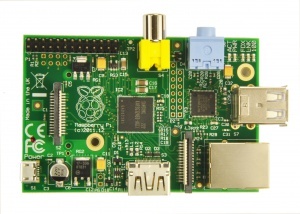 The Raspberry Pi supports a wide range of programming languages, with many tutorials available. Information about installing. specific applications is available through the link. Extensive (boot) configuration info (config.txt) is available here. Information about various utilities that can be used with your Raspberry Pi can be found here. IC Datasheets and schematics links page. Datasheets organised by category from the Frambozenier.org project. Head over to the troubleshooting page for help fixing common problems. Head over to the bugs page for a list of known bugs. Theses are various 3D CAD Versions in both RAR and ZIP. GrabCAD - Solidworks, STEP and IGES of Raspberry Pi 3 Model B. An important source of information and guides is the Official Forum. Get started by following some of the many Tutorials. Common tasks and useful tips are available through the Guides page. Projects can be found, and added to, on the Projects page. Raspberry Pi Datasheets can be found on the DataSheets page. Knowledgeable users may want to review and help out with project wishlist items on the Tasks page. There are many tutorials, example projects and guides in The MagPi Magazine - which is available free online or to purchase in printed form. The Raspberry Pi Foundation's aims include encouraging education. Several groups including Computing At School aim to bring Computing Science back into schools. Go to the Education Page to add your project and find helpful links. Raspberry Jams are a great way to meet other Raspberry Pi users, share ideas and tips and learn more. To find a Raspberry Jam near you, see the Raspberry Jam page. The MagPi Magazine - Community based, free eMagazine, get involved! RaspberryPi Osdev - Hardware specific OS-development community, sitting in freenode.net#raspberrypi-osdev. Do not be afraid to add your bit, content is vital for the wiki to function. Any help translating would be greatly appreciated. Thank you to those who have already contributed!